Please send a gift today to help build safe and secure new homes for those in desperate need. 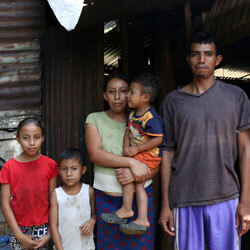 Millions of poor families throughout the Caribbean and Latin America are living in hazardous housing conditions. Your gift to housing will help build safe and secure new homes, provide cement for new home foundations, and install windows and other furnishings that help make a house into a home. *Because of the size and needs of the average family, for $7,600, we build all homes with two bedrooms and a living area, sanitation and a water component. Each family will also receive a solar-powered light kit and furnishings with their home, funded by other generous donors. Any gift of $3,800 will be matched by another generous donor, and you will both receive a Certificate of Appreciation with a photograph of the family standing before their secure and comfortable home. What a beautiful way to honor or memorialize a loved one.